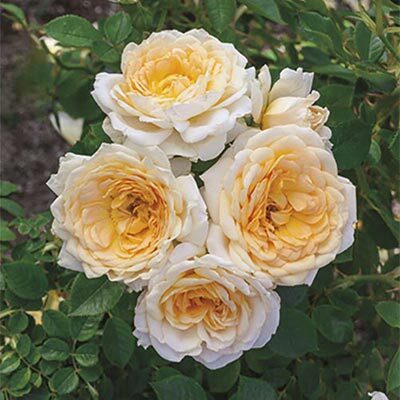 Edith's Darling, the new addition to the popular series of roses inspired by Downton Abbey characters, is a fitting tribute to Lady Edith and her beloved daughter Marigold. The joy Edith finds in her daughter is what you will feel when you're growing this true old-fashioned soft apricot-gold gem of a flower. Although diminutive in size, with a short, compact & bushy habit, rest assured that Edith's Darling is perfect to fill a border or confined spot in the landscape with a great flowering show of full-sized blooms with long lasting coloration. This darling of a rose exudes a strong fresh cut apple and fruity perfume that evokes Edith's unconditional motherly love. Now use your clippers to bring some blooms into the house to create a warm and fragrant ambiance around the dining table!